I've been a little bit bored with my food options lately and decided I needed to find something new to add to my repertoire. As much as I'm a summer-over-winter person, I feel as though I have a lot more go-to recipes in the wintertime (soups, squash-based dishes, etc.) that it's just too hot to make in the summer. It's been a while since I've posted a recipe, so I'll give you a quick background again on my eating habits. I'm what's technically called a pescetarian which means I eat fish, but not meat. I also thoroughly enjoy cooking and am growing a mini garden of herbs on my back porch this summer. I am a self-professed kitchen fanatic, and while my first food-love is baking (here's two kinds of cookies I frequently make: pumpkin chocolate chip and homemade oreos), I tend to make dinner at home so I'll have leftovers for lunch at work about 3-4 times a week. One of the biggest reasons I don't post about my favorite recipes often is because I have an extremely ugly kitchen that does not make for pretty food photographs like those you see here. Anyways, enough about all of that and on to the recipe! When I first make any new recipe, I follow along with it pretty closely unless I know there's something in it I won't like (sorry, onions). I stumbled across this delicious grilled cheese recipe last week and found the original on How Sweet It Is, which I followed almost exactly. Here's her original recipe, and you'll notice I also borrowed her photos (except for the one you see above) for today's post! I strongly encourage scrolling through the rest of her blog for more recipe inspiration. Slice the bread for the number of sandwiches you're making-I went with three, and cut the slices medium-thick. Brush olive oil or spread butter on one side of each slice (these will be the sides face-down on your griddle). To make it easy and less messy, I usually stack the two slices together, oiled/buttered sides together. In a bowl, gently smash the blackberries with a fork until they resemble a jam. If they're not quite ripe/juicy, you can add a little bit of sugar to help draw out the juices. Chop your basil leaves and stir them into the smashed blackberries. 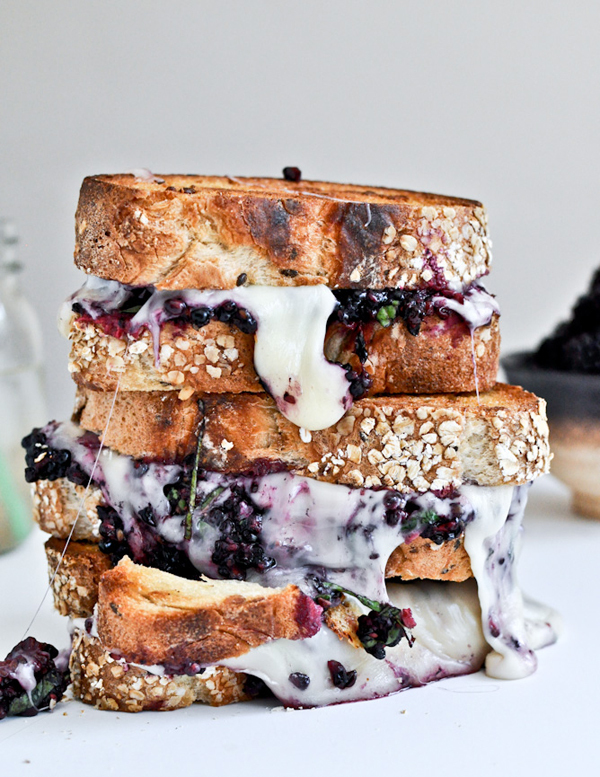 Place slices of fontina on the "inside" (un-oiled/buttered side) of a slice of bread and spoon blackberries on top. Pre-heat and lightly grease your griddle (I usually use a little bit of salted butter, it adds flavor!). Remember to keep your heat on low or your cheese won't melt and your bread will burn! Place the slice with all your accoutrements oiled side down, and top it off with the other slice oiled side up. Let each side cook for 4-5 minutes for a nice, golden brown finish! 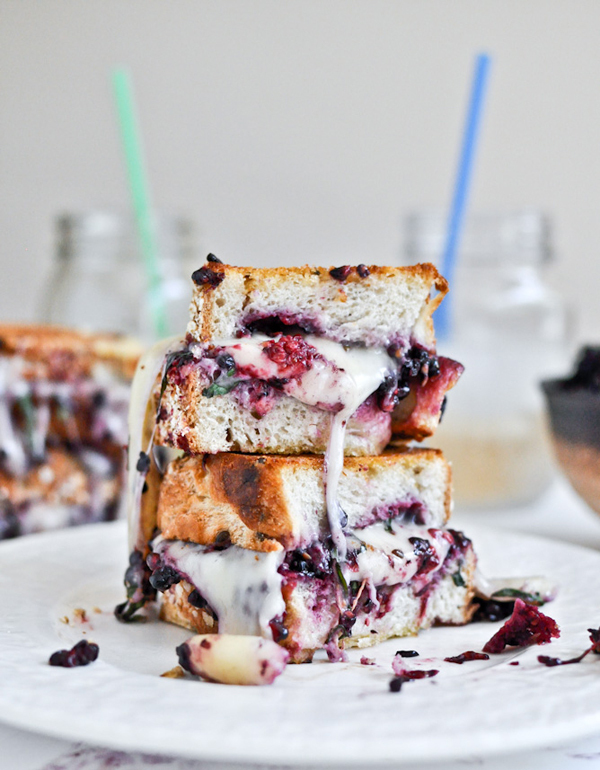 I devoured all three of my mini-sandwiches last night and am definitely storing this recipe for any day I want something gooey, quick and delicious. The best part about this recipe is how easy it is to switch up your ingredients-I might try a drunken goat cheese and strawberry version this summer, too! Would you try this recipe? What kind of fruit or cheese would you use? Let me know below! Oh here we go! I'm so doing this.